Welcome, friends, to my winter wonderland (haha). Wasn't it nice of the snow to pop-in for blog photos? It really was an appropriate and very scenic way to document my recently finished cold-weather dress. Throughout the month of November, I've been playing along with Bimple&Pimble on instagram for a photo challenge she calls #bpsewvember. It's a fun little game wherein each day of the month has been assigned a theme. Anyone participating snaps a picture relating to that theme and adds the hashtag. One of the themes was 'signature style'. It was challenging for me to put my thumb on what, exactly, I define as my style. 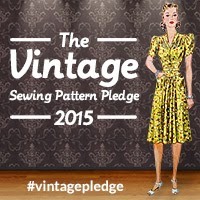 I came up with: comfortable, vintage without being overtly era specific, classic, and quirky. More and more, that description applies to all of the things I make. Funny, I don't think it was a conscious process. It's been quietly evolving in the background. This probably happens to a lot of us who take advantage of the opportunity to customize the things we wear. Knitters fabricate the very fabrics their garments are made of and have options in pattern, yarn content, yarn color, etc... We can also make fit modifications as we work and tweak a garment until we're happy with the result. Sewing is much the same. I suppose it makes sense, that by repeatedly taking liberty with the array of options we have at our disposal, each of us hones our style with each project. After enough projects and preferences, certain themes or ideas start to recur; I guess that's what style is. This recent make conforms wonderfully with my definition of signature style. Although, in recent years, I haven't been wearing as many dresses as I used to. A few years back, I wore a skirt or dress daily. It's really easy to feel put together when your entire outfit consists of a single item of clothing. For one reason or another, I cycled out of the practice. Burn out, perhaps? After making this dress, I think I'm ready to bring a few back into rotation. This particular dress was sewn with cold weather in mind. The fabric is a wool/poly blend I bought from TDO during a sewing blogger meet-up. It was a remnant, and I'm pretty sure it is upholstery weight. It's heavy. It's also cozy and warm. 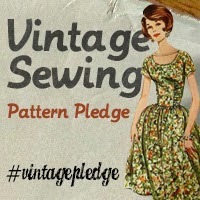 I sewed from vintage Advance 9441 (another #vintagepledge!) Normally, I add a lining to all my dresses, but the fabric is weighty and the skirt is insanely full, so I decided to go without one. The pattern goes together very quickly. To make things even easier, I opted out of facings and finished the neckline and the center-back seam with bias tape. I kept the rest of the inside pretty with french seams. The sleeves are cut-on to the bodice. I spent a lot of time matching up the plaids across the horizontal seam lines, but I completely overlooked the top sleeve patterning. It looks messy. It's the sort of thing that makes me crazy. I care less than I would normally, because I really love the dress, overall. And, my misstep won't prevent me from wearing it. The most time consuming, and most worthwhile, part of this project was sewing horsehair braid into the hemline of the skirt. The horsehair braid works wonders at giving the skirt body and adds a little extra swish. I think this dress pattern is a great classic. It's delightfully June Cleaver, but works well with modern accessories. Mixing eras is one of my favorite things. I should add that to my above style description. Actually, that might be the most predominant element of my style. Our whole house is decked-out an eclectic blend of 1920s-now. Speaking of interiors... we brought the photo-taking indoors to warm-up, and I tried to strike some June-esque poses. June likely would have left the fire to Ward while she was in the kitchen warming some buns. Not those buns.... I fail at domesticity. Finally, my very best June Cleaver. How do you (or don't you) define your style? What changes? What stays the same? Oh my, this post is awesome. :) Your dress is fantastic! I actually purchased a plaid dress from the Gap this year to try to add some more dresses and skirts to my typical pants+sweater rotation. Yours is wonderful, I love the fullness of the skirt. Have you heard about the capsule wardrobe? I don't have the links handy right now but the people who do it talk a lot about defining style and finding your uniform and working it into your wardrobe. Oh my goodness, I love this post, and the dress is amazing. You certainly have inspired me to make something similar next year as we down south, approach winter. My style would be eclectic vintage modern mix and probably cute. I don't seem to be able to do the full grown up style and since I'm already grown, I can't see that part changing! I love how you define your style! This is something that is probably evolving in the back of my mind too--but I have no idea what it would be just yet. Anyway, you look great in that dress! Almost makes me want to live where it snows! Love your dress. I would wear it in a heartbeat. Your fireplace pics crack me up too. This dress is fracking fantastic. Like I might throw a plaid party just to show it off fantastic! well done!!! oh, yes. I love this very much- the belt and shoe styling give it a little edge and it's really fun. I could never dream of looking so elegant in the snow! The picture would be blurred from my vibration, my lips blue, and my hair doing some kind of odd static thing. I'm equally impressed by your ability to stand in the snow as your dress haha! I still haven't tried horsehair braid but your words make me want to give it a go. snow!! i am so jealous! love the dress too, the cut-on sleeves is a really flattering style. Love the dress and the photoshoot! Oh, I love plaid! Gorgeous dress and suits you so much! Love the photos, and I'm jealous about the snow.. I so much admire you, both for your knitting and sewing. First off- you so DO NOT fail at domesticity! Look at that dress! Perfection. Second- the dress, the photos, the shoes.... I love it all! You wear it well. And it couldn't be a better time of year for such a get-up! This is absolutely one of my favorites of all I've seen you sew! The plaid suits you, it really does. Gorgeous! Hey! I missed this post! Lucky me that Handmade by Heather B has linked to it! I love your winter version of a fit and flare. It's something I aspire to make this fall! Your photos are gorgeous, as are you!